I am not very fond of Mushrooms,but this is one of the first Mushroom dishes I ever tasted and liked.Off late,we've been getting very good,fresh button mushrooms here as opposed to the already blackened and wilted ones.I've been planning a mushroom-paneer dish which I saw on Vanitha sometime back,but it never happened.I remember Bharathy posting this as one of the popular dishes on her blog last year and when I had a look I knew that was it,I was searching for that particular recipe,I did not wait any time and made it immediately. I should say I am back to being a Mushroom lover now,tastes so good that once we finished our chapathis,we attacked the leftover curry straight from the serving bowl.One more gem from Bharathy's blog.Try it and you'll know what I mean! Slice onions and mushrooms separately. Add ginger-garlic paste and cut tomatoes.Sauté well till the raw smell disappears and the tomatoes turn pulpy. Cool and grind this into a smooth paste adding vary little water if needed.Keep aside. Heat the 1 tbsp oil mentioned formerly. Add the sliced mushrooms and stir-fry till tender. Add green chillies[if using], chilly powder, turmeric, pepper powder, garam masala and salt in that order. Add the ground paste and mix well adding a little water. Simmer till mushrooms are cooked and the gravy reaches the right consistency. Serve hot garnished with minced coriander leaves and fresh cream if you prefer. 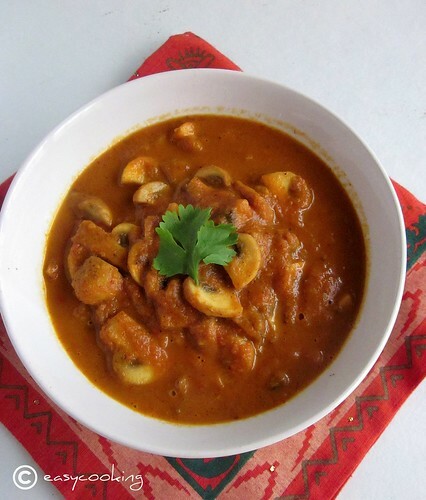 Mushroom masala goes best with any variety of Indian roti or Pulao. This is one delicious gravy!!!! Ideal for lunch boxes too as it is quite easy to prepare early morn too..Im tryin this out this week itself!! Love mushrooms as anything, this masala makes me drool,i dont bother to have with some rotis..
Hi Divya, Can u plz let me know if this dish will have a sweet taste? I want to mak this over the weekend and i m making butter chicken too which is sweet too. So i dont want both dishes to be sweet. 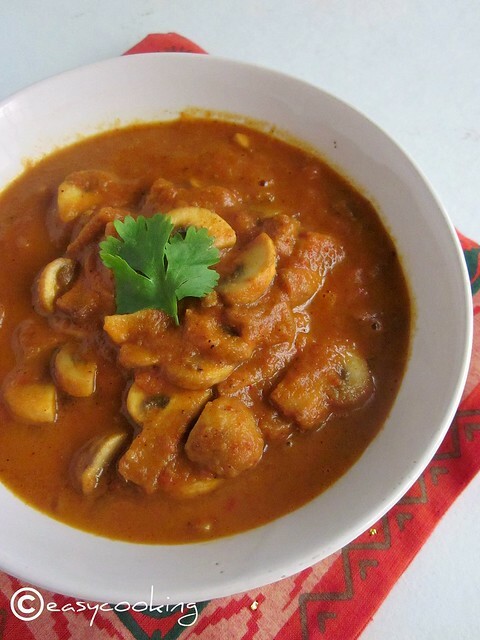 wow mushroom masala looks so creamy and delicious Divya nice color too. U don't like mushroom? I LOVE it and always order one dish with mushroom when we eat out. And yes, its difficult to find good fresh ones here too. Enjoy them while u are getting mushrooms! The dish looks very inviting, the bright napkin makes it even more so! The masala looks so delicious..
Me too not used to eat mushrooms,but trying to make out some gravies,looks like I got a nice recipe! i wish i could cook like you. My MIL would have been so happy!! Looks so yummy and nice. I love the recipe and I think the secret here is the pepper powder that gives it a kick as an aftertaste!! Shall try over the weekend.